Have you been to the JustRite Blog today? If not - here's a peek at today's project I created - you'll find all details posted there! While you're there be sure to check out the Pre-Inked Contest Finalists and cast your vote. You can vote for your favorite card in the pre-inked stamping contest by clicking here. 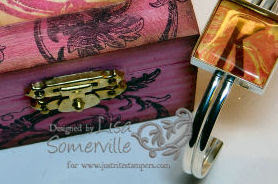 You can vote for your favorite project in the pre-inked stamping contest by clicking here. Voting will be open until 8 pm EST Thursday Oct 23rd. Vote by leaving a comment on each post. The Grand Prize winners will be announce on Friday. love this Lisa - oohh I could make these for gifts this year!! great idea as always! !